Quick reminder: Women can't be beautiful and smart. At least according to this Wet Seal t-shirt. HuffPost Women reader Misty Russo stumbled upon a (horribly) sexist t-shirt at a Wet Seal store in Sugar Land, Texas on June 2. 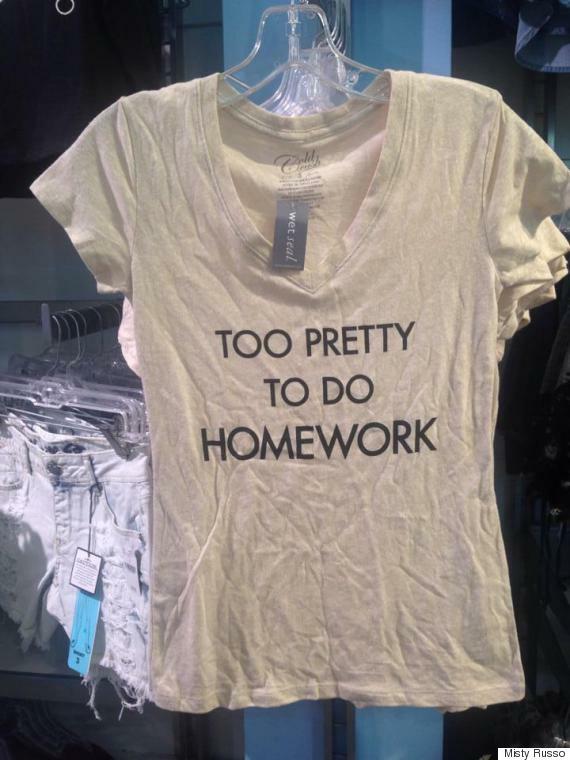 The shirt reads: "Too pretty to do homework." "My initial reaction was that of pure disgust... and disbelief. I immediately thought of a certain young, impressionable 12-year-old girl that I am a role model to, and how I would never allow her or a (future) daughter of mine to wear something like that," Russo told The Huffington Post. "My second thought was that of young girls around the world like Malala Yousafzai who have risked it all just to have a chance at education," she said, adding, "This type of message scoffs in the face of all the adversity women have faced not only here but internationally when it comes to seeking an education." According to their website, Wet Seal's mission is to "use the power of fashion and fun to help our girl express her individuality and fit in -- while standing out." The shirt in question implies using intellect is not a way to stand out. The shirt is being sold on Wet Seal's website for $19.90. This particular t-shirt is almost an exact replica of a shirt that caused uproar in 2011. At the time, a photo of a JCPenny shirt that read, "I'm too pretty to do homework so my brother has to do it for me," went viral, and was subsequently pulled from shelves. Associate professor of sociology at Occidental College, Lisa Wade, told HuffPost in December that these types of messages have a lasting effect on young kids. “They learn their gender identities are very relevant and they learn that there’s a lot of very complicated rules about how to be a girl or a boy, and they’re at that stage of life where they’re trying to learn the rules,” she said. "Young girls do learn that what they look like is very, very important and that does have impact in what they value and what kind of decisions they make and who they think they are," Wade added. "Little girls are constantly told how pretty they are, and they learn very quickly that being pretty is important." Possibly even more important than being smart. The Huffington Post reached out to Wet Seal for comment, but did not receive a reply at the time of publication.